I know they were a nuisance to carry around for the most part. I know they cost the Canadian government a penny and a half just to make them. I know that jars were usually filled to the brim with them, or in little trays at the front counters of stores with a sign that said, “Take a penny, leave a penny.” Coin purses were filled with them, or found at the bottom of wishing wells…and yes, I, like every child before me, swallowed one at least once in their lifetime. 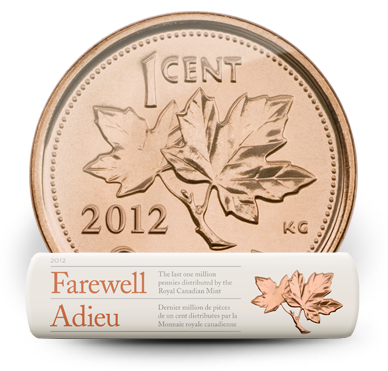 The demise of the Canadian penny is today…and I’m a little sad. I remember when a penny would get you five “penny candies” in the early 60’s. I remember if I had ten pennies in my hand as a little girl I felt rich! I remember learning how to count to ten using pennies! I remember thinking how wonderful it would be if pennies DID rain down from heaven. But no more. And lastly there will be no more “pennies for your thoughts”. Now all we’ll be able to do is “nickel and dime” things to death. I’ve put in my “two cents” worth. Take it or leave it. This entry was posted in Canadiana, Proverbs 16:9 - Journey Thoughts and tagged Canadian penny, favourite sayings, pennies, penny, penny ante poker, penny pincher, penny sayings, penny whistles. Bookmark the permalink. Lynn – my name is Penny, and i’m surprised at how sentimental i feel over the loss of our penny! I would like to make you something in honour of the Canadian penny – i’ve been making jewelry with them. tell me a year that is meaningful to you, your birth month and i’ll make something to send you. “Rub two pennies together!” Darn, I forgot that one!